Universal database explorer for all databases. Connects to any database, via OLE DB (ADO) or ODBC driver. Work with different databases in same time, show data from multiple tables. One professional designed tool for all your databases. Show, Edit, Search, Sort, Group, Filter, Export to file (Excel, XML, HTML, SQL, Text, ADTG), Import and do everything you need with your data. See all database information (Tables, Procedures, Functions). See all database information, Tables (Columns, Relations, Indexes, Check constraints, Triggers, View definition), Procedures (Parameters, Body), Functions (Parameters, Body). 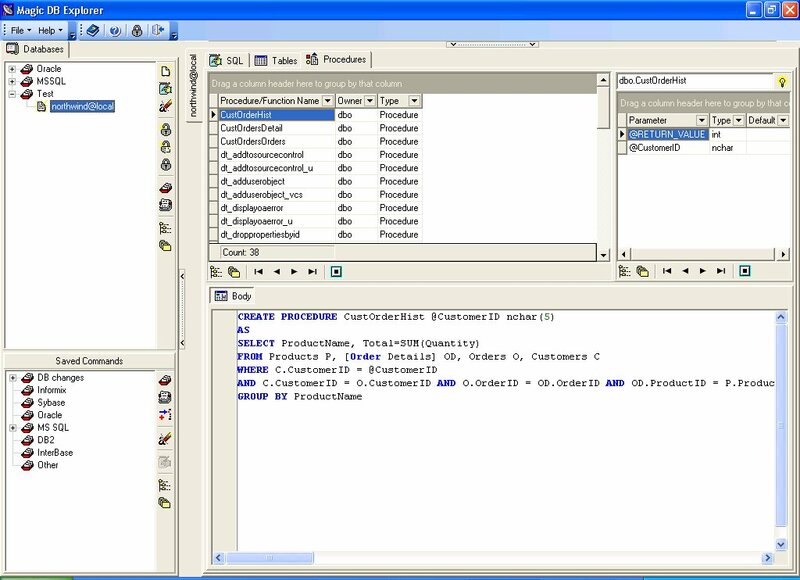 Native database information for Informix, Oracle, MS SQL, IBM DB2, Sybase Adaptive Server, InterBase. Qweas is providing links to Magic DB Explorer 2.5.1 as a courtesy, and makes no representations regarding Magic DB Explorer or any other applications or any information related thereto. Any questions, complaints or claims regarding this application Magic DB Explorer 2.5.1 must be directed to the appropriate software vendor. You may click the publisher link of Magic DB Explorer on the top of this page to get more details about the vendor.